When a US-led coalition invaded Iraq the forward-looking Canadian government stayed out of the war. And if you believe that I have a bridge for sale in Moose Jaw at an excellent price. While the more liberal end of the dominant media regurgitated the former PM’s claim, it’s completely false to say Canada did not participate in the 2003 invasion of Iraq. As Richard Sanders has detailed, dozens of Canadian troops were integrated in US units fighting in Iraq; U.S. warplanes en route to that country refueled in Newfoundland; With Canadian naval vessels leading maritime interdiction efforts off the coast of Iraq, Ottawa had legal opinion suggesting it was technically at war with that country; Canadian fighter pilots participated in “training” missions in Iraq; three different Canadian generals oversaw tens of thousands of international troops there; Canadian aid flowed to the country in support of US policy. As such, some have concluded that Canada was the fifth or sixth biggest contributor to the US-led war. But the Jean Chrétien government didn’t do what the Bush administration wanted above all else, which was to publicly endorse the invasion by joining the “coalition of the willing”. Notwithstanding Chrétien’s claims, this wasn’t because he distrusted Bush’s pre-war intelligence or because of any moral principle. Rather, the Liberal government refused to join the “coalition of the willing” because hundreds of thousands of Canadians took to the streets against the war, particularly in Quebec. With the biggest demonstrations taking place in Montréal and Quebecers strongly opposed to the war, the federal government feared that openly endorsing the invasion would boost the sovereignist Parti Québecois vote in the next provincial election. 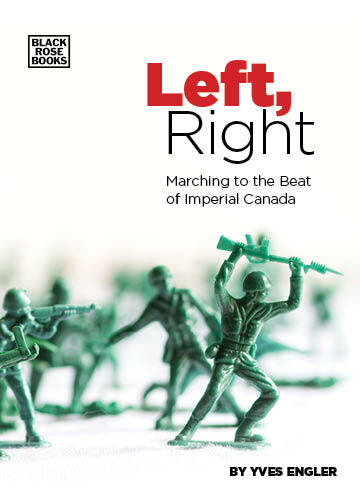 So the Chrétien Liberals found a middle ground between the massive anti-war mobilization and Canada’s long-standing support for US imperialism. Tenth anniversary stories in the mainstream media have mostly erased the role popular protest played in this important decision, focusing instead on an enlightened leader who simply chose to do the right thing. Of course the Iraq war was not the first time that popular movements forced the hand of foreign policy decision-makers. Or the first time that the “official story” ignored the role of protesters. Or the first time that the myth makers twisted the truth to promote the notion of a benevolent Canadian foreign policy. Take the example of Ottawa’s move to adopt sanctions against apartheid South Africa in 1986. While former PM Brian Mulroney and many media commentators now boast that Canada sanctioned South Africa, they rarely mention the two decades of international solidarity activism that exposed and opposed Canadian corporate and diplomatic support for the racist regime. (And as with the Liberals refusal to join the “coalition of the willing” in Iraq, Canadian sanctions against South Africa were half measures). Even though Ottawa prioritized corporate and geostrategic interests above the injustices taking place there for four decades, today much is made about Canada’s morally righteous position on apartheid South Africa. Canadian leftists were outraged at Ottawa’s support for the coup and its unwillingness to accept refugees hunted by the military regime. Many denounced the federal government’s policy and some (my mother among them) occupied various Chilean and Canadian government offices in protest. The Trudeau government was surprised at the depth of the opposition. Similar to Chrétien on Iraq, the Trudeau government tried to placate the protesters all the while pursuing a pro-US/pro-corporate policy. Canadian investment and business relations with Chile grew substantially after the coup. Ottawa did allow refugees from the Pinochet dictatorship asylum in Canada but continued to support the pro-Pinochet and pro-investment policies directly responsible for the refugee problem. As a result of the protests, thousands of refugees from the Pinochet (1973-90) dictatorship gained asylum in Canada, leaving many with the impression that Canada was somehow sympathetic to Chile’s left. But, this view of Canada’s relationship to Chile is as far from the truth as Baffin Island is from Tierra del Fuego. Like Iraq, the partial activist victories regarding South Africa and Chile have been twisted to reinforce the idea that Canadian foreign policy is benevolent. And this myth, which obscures the corporate and geostrategic interests that overwhelmingly drive Canadian foreign policy, is an obstacle to building effective opposition to Ottawa’s destructive role in international affairs. With politicians and establishment commentators refusing to credit activists, it’s important we write our own history. A better understanding of the power of solidarity and especially our victories will strengthen our movements. But at the same time it’s important to be conscious of current limitations. Canadian foreign policy so overwhelmingly prioritizes corporate and geostrategic interests that full-scale victories are nearly impossible in the short or medium term. We’ll achieve no lasting change without fundamentally changing Canada’s corporate dominated political system.